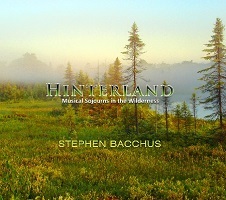 Stephen Bacchus took an extended absence from making music (about 20 years) and journeyed both physically (into the Canadian wilderness) and inward, as he searched to reconnect with his musical persona. In the process of these sojourns, as he states in Hinterland's liner notes, he didn't so much need to find something as to "lose" something. He had to let go of making and producing music and immerse himself in nature. He walked, sat, listened, and recorded nature sounds, becoming tuned into the circadian rhythms of the natural world to the point that his own inner rhythms became synced with those of the creatures he found himself surrounded by. And in the end, he became renewed and has now come back to music again, and that is a very good thing. Bacchus's 1996 album, Pangaea, is one of my all-time favorite recordings in the new age/world fusion genre - a stunning blend of acoustic and electronic instruments, peppered with Asian influences that makes the music sound both familiar and exotic at the same time. Unlike that earlier recording, which featured some guest artists, Hinterland is Bacchus going solo, although the variety of keyboards, synths, and instruments featured on the album might make you think it is the work of more than one person. Hinterland (subtitled Musical Sojourns in the Wilderness) contains twenty tracks, only one of which clocks in at more than four minutes long. Because of this, I would classify these songs as "miniatures" but other than that, trying to set this music into a specific genre is difficult (although there is easily discernible cohesion to the entire album, make no mistake about that). Some songs are more patently electronic sounding, while others contain echoes of the world fusion sounds (most notably the Asian influences) of Pangaea. Bacchus emphasizes notes much more than textures, i.e. while there are ambient washes and effects present in the background, the melody is always first and foremost and notes, many times played in a subdued tempo, occupy the spotlight. There is a forlorn nature to many of those melodies, and even a sense of wandering, not necessarily aimlessly, but more in that one might envision a back country trek where one just lets a path lead him or her where it will. This certainly would fit with the core inspiration of the album, per the liner notes, of Bacchus' many years of hiking the Canadian wilderness and allowing its magic and mystery to permeate his being. However, the music on Hinterland is far removed from what many "nature-inspired" artists in the new age and ambient genres usually record. Comparing Hinterland to, for example, any of Jill Haley's wonderful National Park albums reveals no common ground. To be clear, I am not inferring, in way, shape or form, that nature-inspired music must follow some specific template - just the opposite. I am merely stating that if you expect this to sound like one of the many other albums where the inspiration was the beauty of the natural world, you will be surprised, as I was, to hear these varied electronic (for the most part) miniature soundscapes, and I use the word "soundscape" with the caveat that this is very intimate music, not lush or vista-evocative. Instead, this is music that might convey the wonder and awe of examining a single leaf, or perhaps watching a deer delicately walk through a sunny glade. Another aspect of Hinterland which is atypical are the song titles, of which only a few allude to any nature reference ("The Undiscovered Country," "Beauty in Caves," Getting Above the Clouds"). Instead, some are a bit cryptic ("Nostalgia for the Future", "Friend of Doubt," "The Edge of Remote") while others reflect emotional states ("When I Am With You Again," "Hope Abounds," "No Regrets," "First Innocence"). After multiple playing, I can't say the music on any one track "directly points" to its title, which is a good thing. In other words, Bacchus is not leading you by the hand to some pre-destined emotional or physical end point. Again, this is "wandering" music which, if you allow it to penetrate your mind, will not so much transport you somewhere concrete but it will create the space and vehicle for you to transport yourself should you so desire. With so many tracks on the album, going into specific detail would require a lot more time and space, however, I will say the final three songs are all among my favorites on the disc. "The Edge of Remote" intermixes tones, notes, and quasi-nature sounds, with an underlying pensive keyboard melody and is colored by a blend of somberness and subtle jubilation (there's a paradoxical mix for you). "Hinterland" opens with bass and cello orchestral strings, but short-bowed, which is atypical for new age or ambient music. Piano and swirling keyboards contain a classical influence along with more typical orchestral strings, and are joined by a chorus of frogs! The track has drama, not overblown, however it does stand in stark contrast to the other songs on the album. The closing "All Roads Lead Home" ends the album with energy and cheerfulness, with an underlying peppy synth rhythm and Asian music motifs on assorted keyboards. It certainly conveys a feeling of happiness at returning to the comfort of one's home. I can't imagine what it must have been like for an artist as talented and ambitious as Stephen Bacchus to just walk away from music for such a long period of time, but I can relate to the need to recharge one's muse, as it were (since I struggle with this all the time). One thing I can state is it is great to have him back in the fold, as it were. Hinterland marks a triumphant return for him and the album is a unique take on "nature-inspired" music. Finally, I was particularly happy to hear the occasional "call-back" to the Asian influences of Pangaea.